Time For What Matters | Choose Your Energy: Change Your Life! Have you ever realized that you needed something from another room in your home, but when you walked into the room, you stood there with your hands on your hips, and for the life of you, couldn’t remember why you were there? 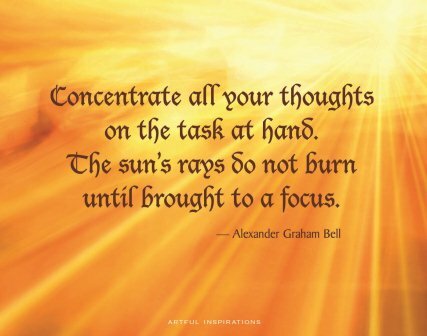 There are many times throughout the day that focus can elude us. Sometimes it means we don’t get a project done at work, we can’t recall the errands we were supposed to run during our lunch break, or we forgot that we needed scissors from the storage closet. As we discussed a few weeks back, fortunately, time is not a scarce resource. That’s right: time is not scarce. We have all the time we need for the things that matter. Our sole responsibility in each moment is to discern, using intuition and reason, what matters most right now, to focus, and to follow through. When you find your focus drifting, keep in mind these simple tips to increase your clarity and productivity. Focus on one thing at a time! You miss important things when you try to overdo the multi-tasking. Use reminders. Keep notes in your phone, diary or hanging on your computer screen. Create a system to help you keep important appointments and other commitments. Make lists. If planning your niece’s birthday party is a priority, make a check-list of critical tasks with timelines to help you stay on task. Eliminate distractions. If your desk is messy and you get sidetracked from important tasks, take time to clean and organize. Prioritize. When everything feels urgent, take time to prioritize what matters most and needs to be done first. Remember to be reasonable and compassionate with yourself. We’re not looking to put you back on the hamster wheel approach to life. Just trying to help you increase your sense of flow by practicing a few good self-management habits. Following these simple tips will help you sharpen your focus while fostering a greater sense of generous, effortless, gracious flow. Click here to visit the portal for my book, Choose Your Energy: Change Your Life (Balboa Press 2013). Explore options to purchase the book online in softcover, hardcover and three digital formats, order an autographed softcover copy, read book reviews and sign up for my book insider club. Click here to visit the portal for my weekly 60-minute Internet radio show on the VoiceAmerica EmPOWERment channel. Access recordings of all past episodes, browse descriptions of upcoming episodes, sign up for my radio insider club, explore guest testimonials and submit a proposal to appear as a guest on my show. This entry was posted in All My Blog Posts, Creativity & Self-Expression, Force, Flow & Baby Steps, Intuition & Intention and tagged Deborah Jane Wells, What are baby steps, What is creativity, What is intention, What is intuition, What is perfectionism. Bookmark the permalink.